Ask 100 fans the above question, and, after factoring out personal allegiances which sway people's responses, you'll always get the answer Kashima Antlers. Even newcomers to Japanese football will know how they last year defended their 2007 league title; a crown claimed along with the 07 Emperor's Cup. That alone paints a fairly clear picture of the modern J. League, but how about over the full course of the league's history? Beyond that you start getting into the realms of (so far) one-off cup winners (Oita) or several time cup runners up (Cerezo). No surprises at the top of the table, then. Kashima are head and shoulders above all comers. Jubilo are up next, and while their time came and went a few years ago, it reflects well the various J. League records they set and which still stand. Marinos always threaten to reclaim, at least in part, their glory days, but it's probably safe to say that Verdy are well past their best. S-Pulse come in far-too-far-below-Jubilo at 6th, joint with Asian Champions Gamba. So anyway, what made me want to spell out the above? Most people don't need proof for what's self evident. Some people however, a good example being Shintaro Kano of The Daily Yomiuri, seem to be living on another planet. "Is it a coincidence that the fans of Urawa Reds, the most successful club in the J.League, are the toughest to please?" Is this a well disguised tongue-in-cheek dig at the perpetual Urawa hype-machine, or does he actually believe it? We've already seen it isn't the case, but worse that that, it's not anywhere close to reality. Even if you dispense with my convoluted points system and look at titles won, Kashima come in first with 12, Verdy and Marinos next with 7, followed by Jubilo with 6. Only then do you get to Urawa, sitting level with Gamba at 5. Average league placings put Kashima first (3.3), Jubilo next (4.5), then Marinos (4.9). S-Pulse pull in a respectable 6.8, and it's only after this that you get to Reds. Last year's finish of 7th should be no big surprise; it's perfectly in keeping with their J1 average - also 7th. "...fans of Urawa Reds, the most successful club in the J.League in 2005 and 2006 (but don't look either side of these years as other teams were winning more), are the hardest to please?" The problem is, that doesn't back up his underlying point of unforgiving fans = successful team, so he seemingly plucked something out of thin air to lend credence to the theory. Urawa are a big, strong team. They have more money than anyone else, and they've had the potential to deliver for years. This is all common knowledge, but save for a brief burst a few seasons ago, they've consistently failed to produce. Given everything, you'd have to be pretty blind to keep peddling the myth of "most successful team". Shintaro Kano is guilty of lazy, not to mention entirely inaccurate, "journalism". Re-writing history to suit your own ends? That's how dictators get started, you know. Not that it was ever in doubt, but yeah, in stoppage time we scored two goals to win us supremacy over Jubilo. Here's a little something I knocked up in a spare half hour. It's no work of art, but feel free to download it and use it as your desktop wallpaper. The captain and vice captains have been announced for 2009. After Takagi's departure over the winter, Hyodo has stepped up from last year's vice captain role to take over as skipper. Vice captains for 2009 are Kodama and Okazaki. Okazaki, still only 22 and making a name for himself in the national team, has a bright, bright future ahead of him. 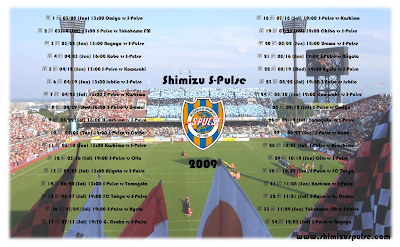 The 2008 season is now behind us, so here is a full record of our performance in the league, Nabisco Cup and Emperor's Cup. 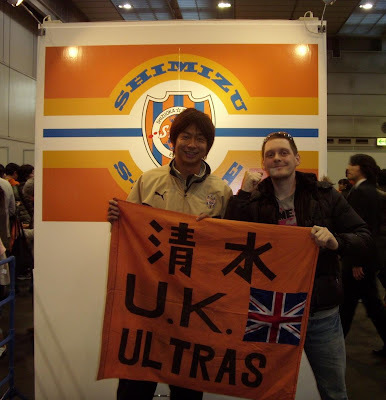 UK Ultras reports are linked where available. Click on the above links to jump to the records in question. Not a bad fixture list, and as it turns out we weren't wrong about the Omiya opener! There's rather too many Sunday games for my liking, including the otherwise easy away days of Kawasaki, Marinos, Nagoya and Jubilo all on Sundays. What with work early on a Monday morning, these being on Sundays is going to impact on whether I can get to them or not. The Derby is a given though, obviously! The trek out to Ecopa for the home game with Urawa is a pain, but home advantage isn't as important for this one as it is for the derby, (which is at 'Daira), so we may as well milk the Red travelling army for as much as we can in gate receipts. Security issues have been officially cited as a reason why this one is to be at Ecopa, and add this to the fact it falls at the start of the Golden Week national holiday bonanza, and we may well see way more through the gates than 'Daira's 20000 limit. Either way, it'll be fun to use Ecopa as a home ground - it's been a while! Well, the home derby at 'Daira on a summer Saturday night will be awesome, and it's the one out of that lot I really can't wait for, but I guess that's a no brainer. If it's anything like as heated and electric as the 2-1 win back in '07, then we're in for a cracking night. There's a number of potentially huge BDOs in there too, Gamba, Hiroshima and Nagoya to name but three! The top two from each group go into the quarter finals with the four ACL teams to make up the final eight. For a greater breakdown of how the tournament is organised (I use the term loosely) this year, click here. S-Pulse win 4-2 on aggregate. FC Tokyo win 3-2 on aggregate. And who should have got Japan's first two goals? Well done Okazaki on your second and third goals for the national team. By all accounts it was a poor Finland side which turned out, but it's still good to see that Okachan has his scoring boots on ahead of the new season!